Social media can be used to position you as an expert and help reach your ideal customer. But with so many platforms available, which is best for your business? Okay, calm down over there. 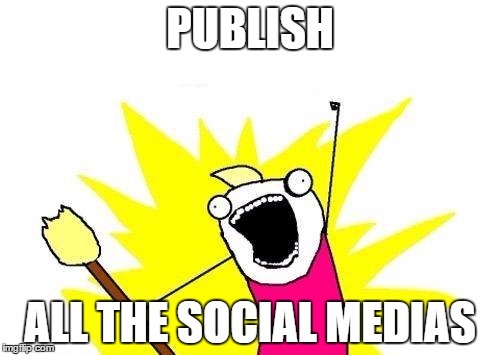 Don't just start posting your content across every social media platform. You'll confuse your audience and burn out your efforts quickly. "Before you begin sharing content on any platform you must understand your goals, reach, engagement & metrics." Each platform has a specific purpose and audience which helps in creating a strategy for content on each channel. Do a bit of research to see where your core audience lives. Are your ideal customers and clients utilizing Facebook? Are they using Twitter to find the types of content and/or products you offer? If you're using email marketing, try sending out a survey to your audience to find out what platforms they prefer. Or, check your analytics to see where you're already seeing the most engagement from your readers. Once you receive this feedback you'll have a starting point to tailor your social media strategy toward your audience's preferences. Understand how conversations shift within each platform. For example, the conversations you might have on LinkedIn will be quite different from the ones you have on Twitter. LinkedIn is a networking platform for business professionals. The conversations are a little longer and have a more professional tone. Twitter is known for their 140-character limit for content. The conversations here will be quick and can have a more laid back tone. To get you thinking, we've outlined some ideas on audience, content, and insights for some of the more widely-used social media accounts for businesses: Facebook, Twitter, Instagram, and LinkedIn. REMEMBER: before you get going on any platform, make sure you know who it's for [TARGET AUDIENCE], what you're sharing [WHAT CONTENT], and what the value is for your business [BUSINESS VALUE]. You can even put together a nifty social media mission statement that supports your overall content marketing mission statement. There is no one-size-fits-all solution for businesses on social media. Is the social media channel performing well? Is it meeting your business objectives? If not, find out why. Evaluate your progress on a regular basis and make changes as needed. Social media is not a "set it and forget it" type deal. To see results, you have to put in the work. Need help with the work? Let us know.